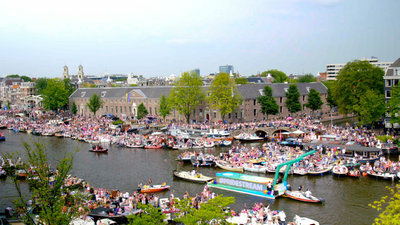 Nearly 70,000 people for whom Gay Pride is not a self-evident concept were given a 360° experience while ‘sailing’ on a boat in the Canal Parade. Applying innovative technology via the secure website pridestream.org, the Pridestream enabled everyone worldwide to experience the Canal Parade through a livestream, as if they were on a boat themselves. 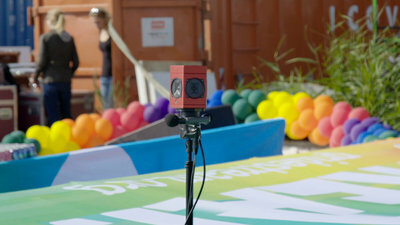 A 360° camera on the boat made it possible for 67,984 people in 128 countries to watch the Canal Parade. In many of these countries, homosexuality is still officially illegal or taboo. Using their smartphones, iPads or computers, they were able to see what it was like to be a passenger on one of these boats, complete with sound and video. This virtual experience was made possible for them when they moved their device, allowing them to look around, rotating a full 360⁰. Everyone could experience this feeling of freedom for themselves, and be part of the celebration and the crowds cheering from the banks of the canals. In addition to the camera, the boat was also equipped with LED screens playing videos of people from all over the world, showing that they were also ‘sailing’ on the boat. For countries where Gay Pride is not a self-evident concept, several privacy tools were offered on the site so that people could feel safe ‘sailing’ on the boat and leaving messages. The entire stream was broadcast via 4G, and the estimated 600,000 spectators along the Canal Parade route also created even more traffic and pressure on the network. It was a major challenge to ensure the Pridestream still worked under these stressful network conditions. In order to send the entire stream via the 4G network and to guarantee a stable and strong data signal, a variety of special techniques were applied, including SIM hubs, antennae and extenders. The fact that this connection was also maintained from a boat sailing down the canal is also unique. Another major challenge in the project was to successfully transmit the 360º Pridestream feed in a mobile browser. ‘Displaying a 360º image pre-produced in a mobile browser has already been done, and a livestream has also been transmitted in a mobile browser before. However, broadcasting a 360º livestream in a mobile browser means going one step further. This was really pushing the limits of what is currently technically possible,’ according to Ciaran Woods, Producer at MediaMonks.